Georg Philipp Telemann was one of the most prolific composers of the baroque era. His production in almost any genre of his time has overshadowed his capabilities as a performer. We know that he played most then common instruments, and even some less common, such as the trombone and the mandora, a type of bass lute. However, it seems that he wasn't a true virtuoso on any of them. He himself considered the violin as his first instrument. When he was Kapellmeister in Eisenach, among the members of the chapel was Pantaleon Hebenstreit, not only the inventor of a type of hammer dulcimer but also a brilliant violinist. When they had to play together Telemann locked himself up and practised diligently "so that I would be somewhat able to rise up against his power". This confirms the impression that he certainly was a capable performer but not a real virtuoso. He probably didn't consider that a major problem as he didn't like virtuosity anyway. It is this feature of many Italian concertos which made him keep some distance from the Italian style. He generally preferred the French taste. "In most concertos that I saw, I encountered difficulties and crooked leaps but little harmony and still worse melody, hating the former because they were inconvenient to my hand and my bow, while I could neither love nor imitate them because I missed the latter qualities, my ear being accustomed to them in French pieces". Telemann's music for violin generally avoids too much virtuosity: double-stopping is very rare, and he didn't exceed the fourth position in his sonatas. It is also telling that the six sonatas recorded here are Telemann's only sonatas exclusively for the violin. In others it is one of the options; these can also be played by, for instance, the transverse flute or the oboe. As much as Telemann preferred the French style and kept the Italian taste at some distance, Stephan Schardt believes that these sonatas are strongly influenced by Vivaldi. In his liner-notes he regularly refers to the latter's sonatas op. 2 which include various features which are also present in Telemann's sonatas. He also mentions influences from Corelli and Albinoni. These sonatas are all in four movements, following the model of Arcangelo Corelli. They seem to have been ordered according to a certain pattern: the odd sonatas are in minor keys, the even sonatas in the major. The first two sonatas are a sonata da chiesa and a sonata da camera respectively, the third and fourth are sonate da chiesa and the last two sonate da camera. Later Telemann reprinted them in a different order. Here the original order of the first edition is followed. 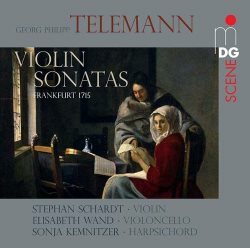 As one should expect from Telemann these sonatas include various notable features, not least several movements in which he shows his great admiration for folk music, especially from Poland. Examples are the second movement from the Sonata III and the last movement from the Sonata IV. Other aspects include the wide leaps in the opening movement of Sonata II, the sudden modulation at the end of the last movement from Sonata V and the syncopation in the corrente from Sonata VI. The programme is completed with the Ouverture in g minor which is included in Der getreue Music-Meister, a collection of vocal and instrumental pieces which was published in 1728/29 in the form of a periodical. It comprises six movements, and closes with a piece called Irlandoise. In his liner-notes Schardt rightly states that it is questionable whether Telemann had ever heard Irish music. It seems that at that time a degree of fantasy reigned in respect of countries and cultures of which most people probably knew next to nothing. Schardt also talks about issues in regard to interpretation. In the case of the Overture he writes that "we have made up for the lack of orchestral colours by varying the harpsichord registration and contrasts in dynamics". I have no objections to that but I find his reasoning less than convincing. The overture was not only an orchestral form, it could be used for any scoring, including harpsichord solo. From 2000 to 2005 Stephan Schardt was leader of the German ensemble Musica Antiqua Köln. That makes one expect a style of playing which is in line with what was typical of this ensemble. As I have always greatly admired that style I can't help feeling a little disappointed by these performances. Dynamically Schardt's playing is much less differentiated than I had expected, and the same goes for treatment of stressed and unstressed notes. In various slow movements he plays legato surprisingly often. I could not find a score so I can't tell whether this is indicated by Telemann, but I very much doubt it as it is not in line with what was common in his era. Don't misunderstand me: this is a nice disc which fills a gap in the Telemann discography as - to my knowledge - it is the first recording of these sonatas. It is just that I had expected more and a somewhat different approach. I realise that some may bother less about the features I have criticized. They should not hesitate to add this disc to their collection.